At the general membership meeting on Thursday July 12th HANC hosted a discussion in the round with guest presenters Rob Joyce, from Hayes Valley Farm, Please Touch Community Garden, and a developing network of urban agriculture sites on the Blue Greenway; Pancho Ramos Stierle from the Free Farm, and the Occupy the Farm initiative at the Gill Tract; and, Ed Dunn, from the Kezar Garden and Ecology Center. Rob shared his perspective on the conditions that have become a pattern of success for initiating and maintaining a successful urban agriculture site. He suggests having a track record of success, a "champion" or connection with a public official, and support from a local organization from the immediate area around the site are crucial to success. He also recommends having people in public positions or those with strong opinions about urban agriculture to visit the site where they can see and reframe their expectations. Pancho shared the story of the Gill Tract and the astonishing and passionate community support for maintaining food production for people on that site and not in favor of developing the site with housing and grocery store. He maintains that love and supportive compassion for all parties involved will be critical for having urban agriculture reaching its potential of creating community and connection. 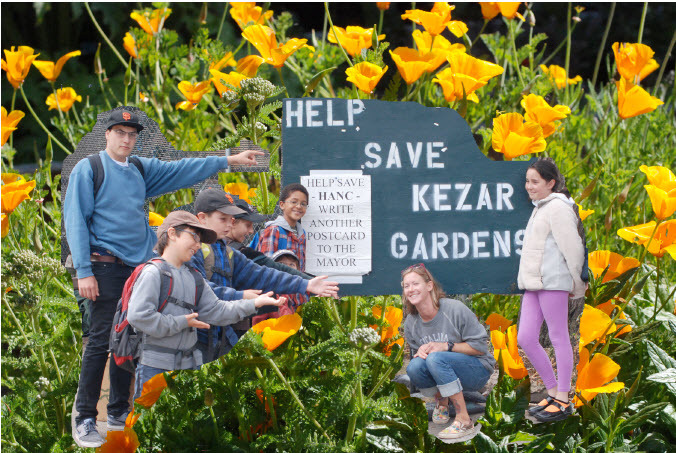 Ed Dunn shared the latest update on the status of the Kezar Gardens and Ecology Center and took questions from those gathered as to what they can do to support the site and prevent it from being evicted by San Francisco's Recreation and Parks Department. Give your summer garden a boost that will guarantee vibrant colors and tasty veggies for the months to follow! Aside from encouraging beneficial soil organisms and conserving a non-renewable resource, composting makes an excellent fertilizer that releases nutrients slowly at a rate which the plants can use them. This fun, hands-on class teaches methods for backyard and worm composting for home and community gardens. Come learn what you can do to improve your garden and prevent organic waste from ending up in the landfill! Rot on! Year-round vegetable gardening is integral to creating a foodsystem whose values reflect seasonality, locality and clean food. To take full advantage of the unique gardening climate in San Francisco, it’s important to know your vegetable garden’s needs each month. Join GFE and local gardener Carey Craddock as we take a closer look at what to do in your garden in July to ensure you reap a harvest that will afford you Victory Gardener status. Its summer in San Francisco! Which means one thing - FOG! This month will focus on garden troubleshooting, fertilization, managing weeds, as well as a tour of what’s growing at the GFE in July. Join us on the 2nd Saturday of every month to learn seasonal tips for year-round vegetable garden! Bring on the bounty! Are you thinking farming your fire-escape, tending herbs on your windowsill or growing edibles on your patio? This class is for you! Learn how to choose the right pot, the right soil, and most importantly – the right crops for your containers. Instructor Johanna Silver experiments with all sorts of containers in Sunset Magazine’s test garden, from homemade self-watering ones, to galvanized steel, to turning straw bales into planting space. Yes, you too can grow food in even the smallest urban spaces! Join GFE and local beekeeping instructor Paul Koski of the San Francisco Beekeeper Association for a very hands on Part III of our Urban Beekeeping Series. If all goes well, an urban honeybee colony should produce about 30-40 lbs of excess honey by the fall of each year. This workshop will discuss the factors that affect honey production, honey extraction and timing, and how to assess how much honey a colony will need for winter. This workshop will also present the varied methods of honey harvesting and discuss the pros and cons of each. Depending on the amount of honey produced in the GFE hives and how it is stored in the honeycomb, we will demonstrate several honey harvesting methods including cutting the honeycomb into chunks, crushing and straining, and uncapping and extracting the honey frames. Come join us, it is going to bee sweet! We will be honoring Community Gardeners [100 at Kezar Gardens], Hosting Informal Meetings with District 5 Supervisor Candidates, and having a Picnic in the Gardens! Jumpy House and other family-oriented activities. Join HANC, community gardeners, and the urban agriculture community, at our general meeting on Thursday, July 12, beginning at 7:00 pm, downstairs at the Park Branch Library, 1833 Page Street. Within the last year, community garden and urban agriculture sites in San Francisco, including the Free Farm (at Gough and Eddy), Hayes Valley Farm (at Oak and Laguna) and the Kezar Gardens and Ecology Center (at 780 Frederick), along with the more high profile Gill Tract (on UC Berekley property in Albany in East Bay), have all had to reckon with the uncertainty of tenure and permissible use for growing food for people. Each of these sites has its own story of impending change of land use, displacement or eviction of farming activities in favor of housing and commercial development except in the case of Kezar Gardens and Ecology Center which is being faced with the possibility of being evicted in favor of another community garden. At the HANC general membership meeting on Thursday July 12th we will hear from community members involved with these sites and learn more about the current status of these sites and solicit discussion from members about land tenure and community gardens and urban agriculture. The Free Farm is currently on a vacant lot owned by St. Paulus church at the corner of Gough and Eddy. Earlier this year, St. Paulus signed an agreement with Maracor Development to go ahead with a plan of selling the land to them and having it developed for market rate housing and a new church building for St. Paulus. The Free Farm has some 24-36 months until “entitlement” or when the city gives final approval for the building project. This will include an environmental impact report, community meetings with the neighbors, coming up with a design, and dealing with all legal and building issues. Once entitlement is reached the church signs the property over to the developer. Maracorp Development has required that the Free Farm be removed from the site 6 months before entitlement happens. The Free Farm is currently searching for a new location (or locations) in the city. Also at July's meeting will be representatives from Mercy Housing and the Arc to answer questions about their plans for 1500 Masonic. Mercy Housing and the Arc San Francisco are collaborating to renovate the long vacant property at 1500 Page, at Masonic, to provide 15 units of housing for low-income persons who are developmentally disabled. Renovations will create 12 studio and 4 one-bedroom apartments as well as spaces for resident services. Funding for the renovations has been committed by the San Francisco Mayor's Office of Housing and the U.S. Department of Housing and Urban Development. Mercy Housing California is a nonprofit corporation whose mission is to create and strengthen healthy communities through the provision of quality affordable, service-enriched housing for individuals and families who are economically poor. It developed the old Southern Pacific Hospital site at 333 Baker into 158 senior and 36 family affordable homes. The Arc San Francisco is a non-profit service and advocacy organization for adults with autism, Down syndrome, cerebral palsy, epilepsy, intellectual and developmental disabilities and their families living in San Francisco and San Mateo counties. The Arc provides a range of services relevant to all areas of adult life, from independent living supports and skills building to employment training and creative expression. 8 Washington is designed to take advantage of public views created when the Embarcadero Freeway came down. Sue Bierman worked to make that demolition happen. It is SUE BIERMAN PARK that will be walled off by the 8 Washington project. The extreme luxury housing on this site would eliminate a community recreation facility (outdoor swimming pools and tennis courts) serving seniors and children and seniors. FACT - Height limits along the waterfront have NEVER been increased since they were first adopted 50 years ago. FACT - San Franciscans are out on the street gathering signatures on a referendum petition to challenge the first ever height increase - to 136’ across from Sue Bierman Park at Washington and The Embarcadero. FACT - The height increase is for a project designed to be the MOST EXPENSIVE CONDOS IN SAN FRANCISCO - $3 to $8 million condos. The physical petition is over 540 pages long - the size of the phone book - because the developer and City dumped documents into “the file” to force the petition to be that long. Could you help circulate a petition? Call Sue Hestor at 846-1021 or go by the NO WALL ON NORTHEAST WATERFRONT headquarters at 15 Columbus (894-7008). Petitions will be available for signing at the July 15 HANC picnic. PETITIONS MUST BE TURNED IN THURSDAY, JULY 19. PLEASE HELP US GET THE 20,000 VALID SIGNATURES WE NEED.